Public Service Commission of Rajasthan few days back published an advertisement for recruitment of Lecturer posts in various Schools. 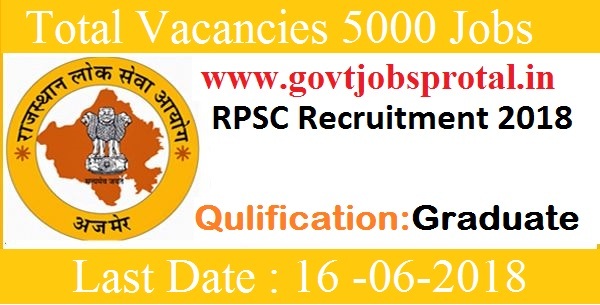 There are total 5000 posts which are going to fill up through this RPSC Recruitment 2018. All Indian candidates who full fill all the eligibility criteria can apply for these Government jobs in India through online process. The process for applying online will be start’s on 17th May 2018 and the last date for applying online is 16th June 2018. More information about these Government jobs in India under RPSC is given below in this post. Read the complete article carefully before applying online. Age Limit: The Minimum age limit is 24 Years and maximum age limit is 40 Years. What is Educational Qualification for RPSC Recruitment 2018? The all Indian Graduates Candidates and completed B.Ed from a recognized University/Institute are eligible to apply. Those who are interested in these Government jobs in India can apply online with the official website. Below we share the link below related to the official links.